In February 2014, The 300 Committee became the official owner of 14.75 acres of land off Gifford Street in Falmouth. Donated to the land trust by Atria as a condition of the development permit for Atria Woodbriar Place, the land not too many years ago was the Woodbriar Golf Course, a popular 9-hole, par 3 course in the center of town. Today this land is permanently protected with a conservation restriction held by the Compact of Cape Cod Conservation Trusts (The Compact). 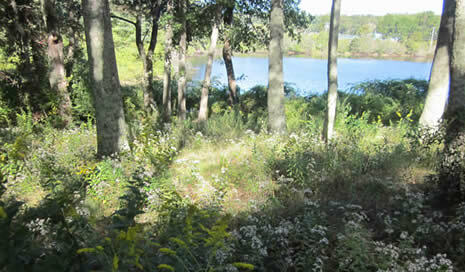 This parcel is special for a number of reasons: it includes an Atlantic white cedar swamp and it has lovely frontage on both Jones Pond and Sols Pond, hence the name, "Two Ponds." Plus it is minutes from Main Street and is visible and easily accessible from Gifford Street. The accessible pathways and benches on the site are open to the public. Four parking spaces for visitors to the conservation area are located at the northern end of the Atria Woodbriar Place parking lot. We are seeking grant support for these public access improvements from the MA Department of Conservation & Recreation (DCR) Recreation Trails Program; we are grateful to several generous T3C friends and members for additional project funding. Two Ponds Conservation Area was the site of a new invasive species removal experiment. For two weeks in May 2016, The 300 Committee rented goats from The Goatscaping Company, based in Plympton, MA. Used increasingly in areas all over the country, goats have proven to be a low-impact, chemical-free way to control invasive plants, poison ivy and overgrown areas. They also help improve soil quality! A typical “goat crew” of two to four goats can clear one-quarter to one-third of an acre per week. T3C is grateful to The Friendship Fund for the grant that made this goat grazing trial possible and we were pleased with the results.